Hello, my name is Michael. I have created this because I could not find any helpful information regarding tattoo removal experiences when I needed it. I hope I can be of any help to anyone else going through the same ordeal. 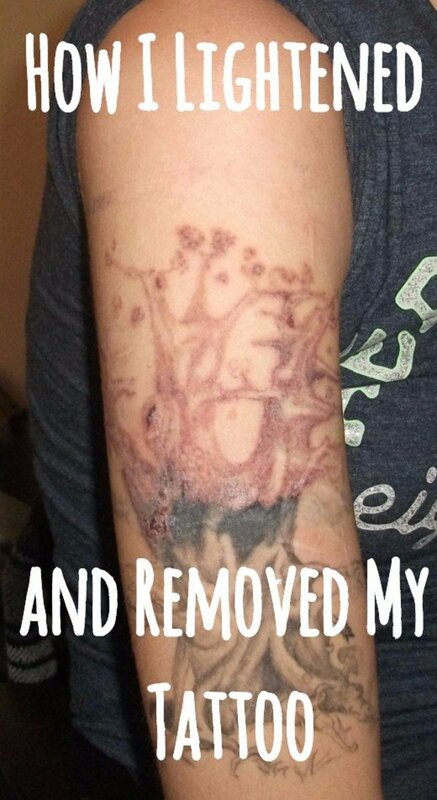 I just want to try to explain my experiences and my decisions to anyone who is interested in tattoo removal. Over the course of three years, from 2007 to 2010, I went through ten very painful laser removal treatments. It was a lot of trouble just to find a professional who could do the treatments, much less try to find the best price. After researching possible places that offered laser removal, I decided on Immortal Images in Charlotte, NC. They offered a relatively low price and were very professional. I unfortunately do not have any pictures of the laser treatments after they were performed. 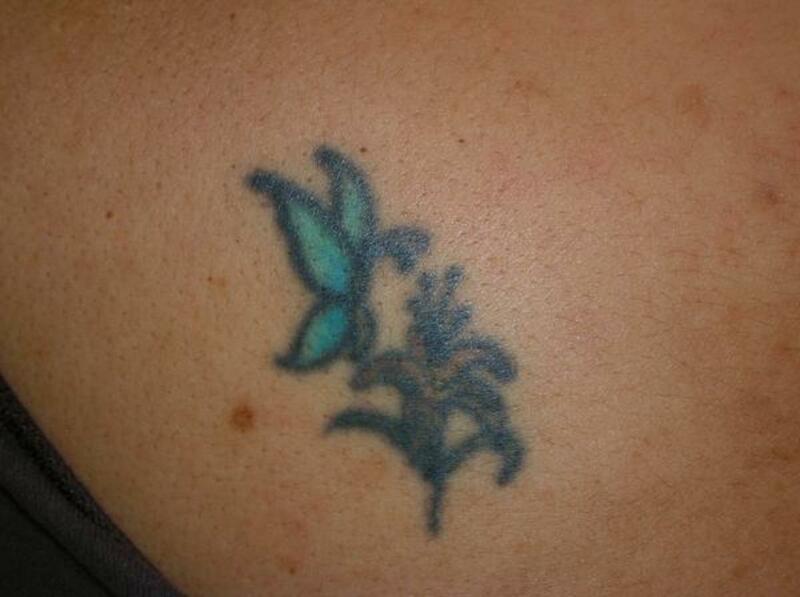 Does a Tattoo Laser Removal Hurt? I will say that the initial five treatments were the most painful. I had a lot of blistering and some bleeding. The experience can be described as a very painful burn, and it will take quite a lot of tolerance to get used to the pain. The wound would heal in about 1-2 weeks after each treatment. I would then go back to have another treatment done after 2 months. The price for each session was $150, and the treatment lasted about 10-20 minutes each time. After about five treatments, they stopped hurting as much. 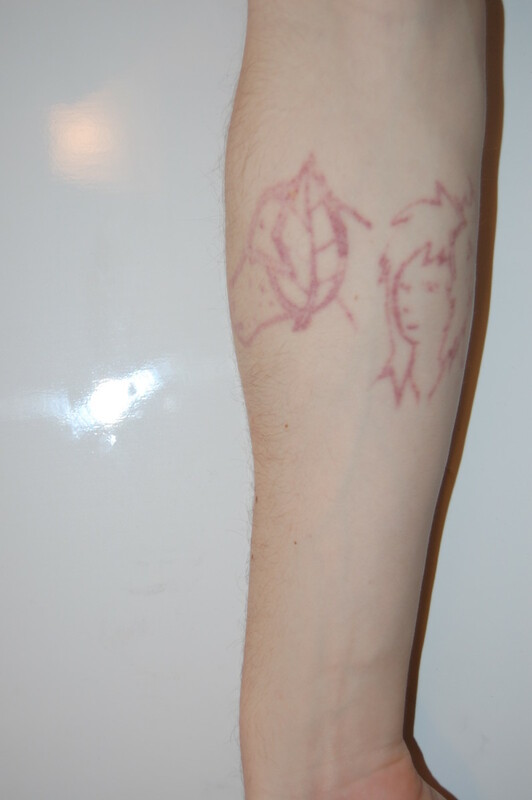 The only concern besides my tattoo not fading was the possible discoloration of the skin from the laser. The tattoo on my left arm was successfully removed without any discoloration. The tattoo on my right arm was not removed successfully, for unknown reasons. I was told that the type of ink that was used could have been plastic based, which is harder to remove. Since most tattoo artists mix their own ink there is no way to tell for sure. Also, there are no FDA standards for tattoo ink. I could not wait any longer so I did more research. I researched plastic surgeons, sent emails and took pictures, and requested pricing. For the most, part they all said the same thing: that the tattoo would take 2-3 sessions and would consist of the tattoo being excised out of my skin or I could choose to do skin grafts. Skin grafts would mean more anesthetic. I chose excision. 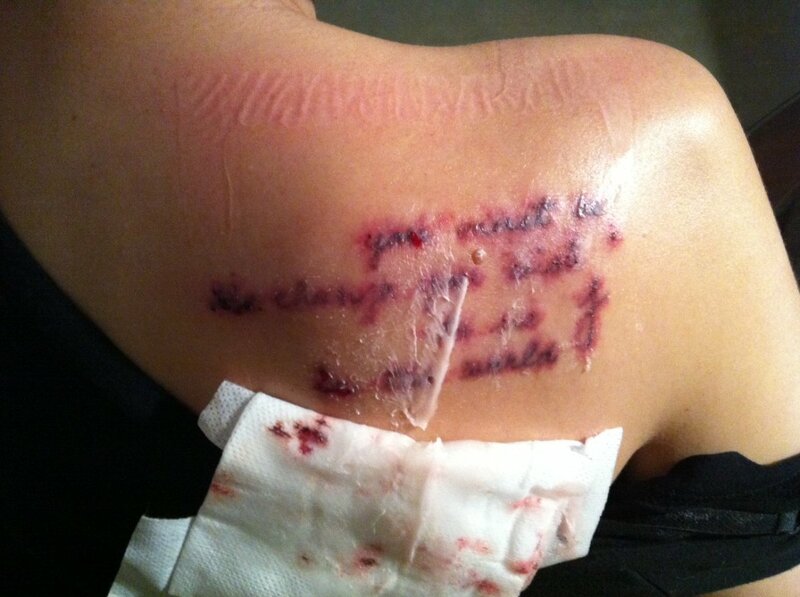 They began by numbing the area of the tattoo. I was placed in a chair and was able to watch the entire procedure, which took about an hour. 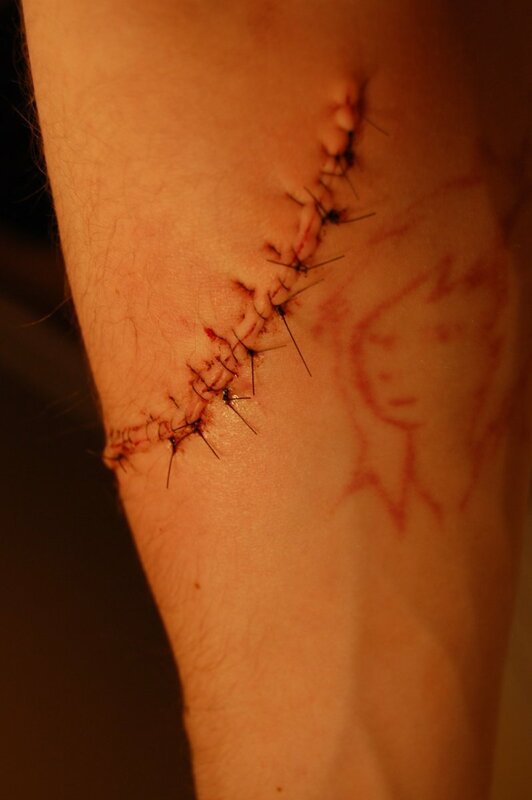 An ellipse around my tattoo was made and the tattoo was cut away from my arm. The remaining area was sewn closed and stitched. My doctor was very cool and answered any questions I had for the procedure. 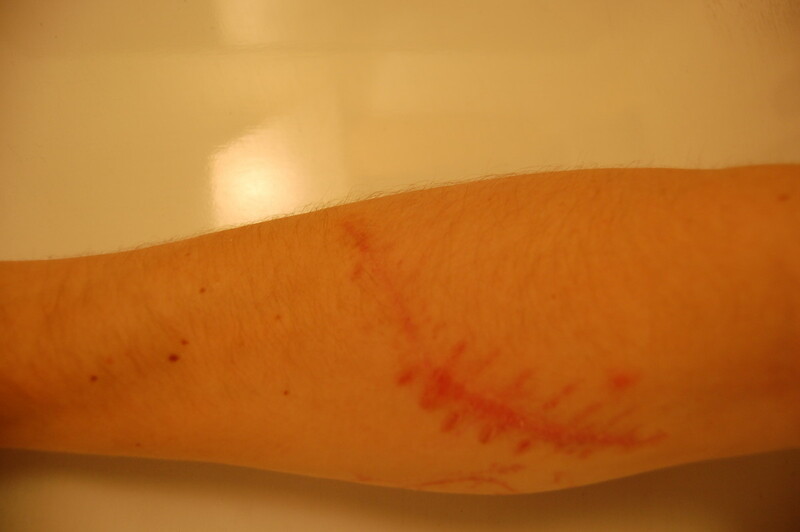 The night after the procedure I started to really feel my arm and there was some discomfort. Two days after the procedure I felt fine and was able to extend my arm normally. I am going back to have the second half removed with the same procedure in 6-12 months when I've fully healed from this procedure and my skin has stretched back to normal. The price for this procedure was $850 and the consultation was $50 dollars. In total, the cost for the two excision procedures was $1,750. The total cost including the excision, which was $1,500, was $3,250. This does not include the gas money and the tip for each visit to North Carolina, which totaled about thirty dollars for gas each time and a 20 dollar tip. So, add another $500 or so and that adds up to $3750 dollars. 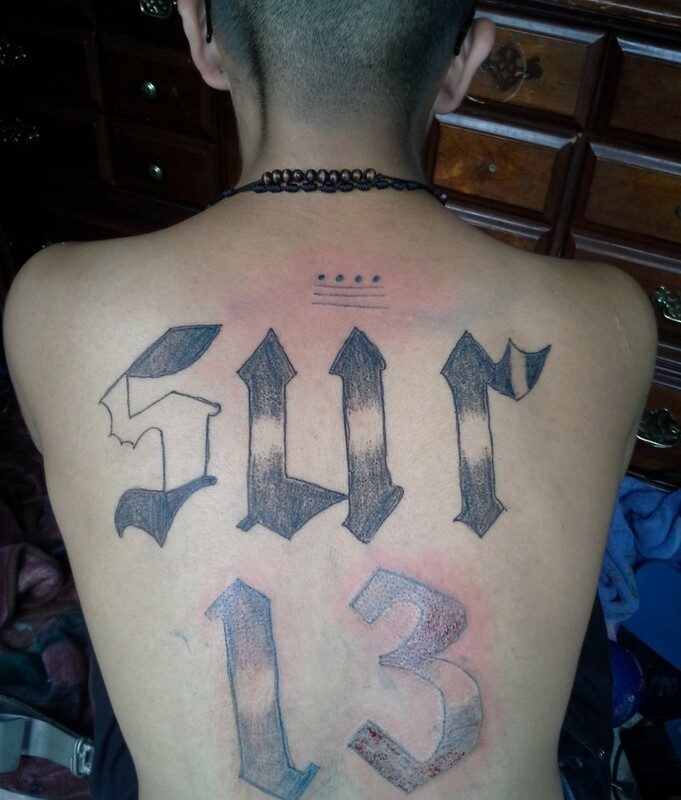 My tattoos originally cost me $240. I got them in Richmond, VA when I was 18. I am now 24. Make sure that the plastic surgeon that you find is certified and check his or her credentials. Schedule a consultation and ask all the questions you have. There are some factors that will determine whether tattoo excision is right for you, such as your tattoo size and the location of the tattoo. This has been a really good learning experience and hopefully I can help anyone else understand the agonizing and drawn out process of removing a tattoo. Hi Michael! Thanks for posting this. I've been researching a long time, and there are very few doctors in my area that do excision. Can I ask where you got yours done? I have a pretty small 1x1 tattoo on the top of my foot. 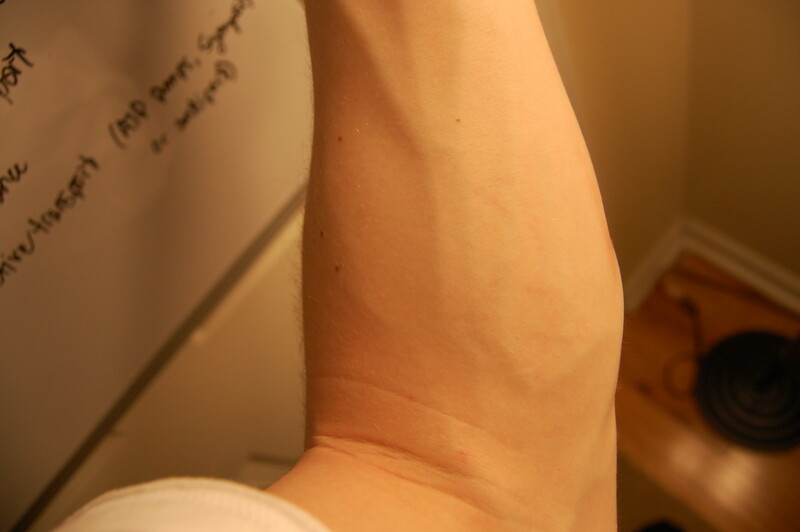 Is it possible to get excided considering the skin is so thin and tight? Also can you please post your surgeons info? 4 inches x 4 inches,would I even qualify? It's on my upper left bicep and I do not mind a small scar,roundabout price if you could? What color was the tattoo originally? How much did the excision cost? & can you set up payment plans? Thanks so much Michael! I just started my research into this, glad I found you! Hi, I had a tattoo removed from my ankle by excision. Although in terms of the bigger picture I'm really pleased with the result (no tattoo), I do have a permanent scar that is still quite pink after a year and a half. It was made worse by the fact that the scar split open about four days after I had the stitches removed, and I was on holiday abroad so couldn't do much about it. The scar is therefore much wider than it could have been. So if anyone is thinking about excision in an area where the skin is very thin (such as the ankle) and needs to be stretched, I would recommend leaving the stitches in for longer, even when they start to itch. Other than that, excision is one of the best decisions I've made. It sounds dramatic but it's changed my life. 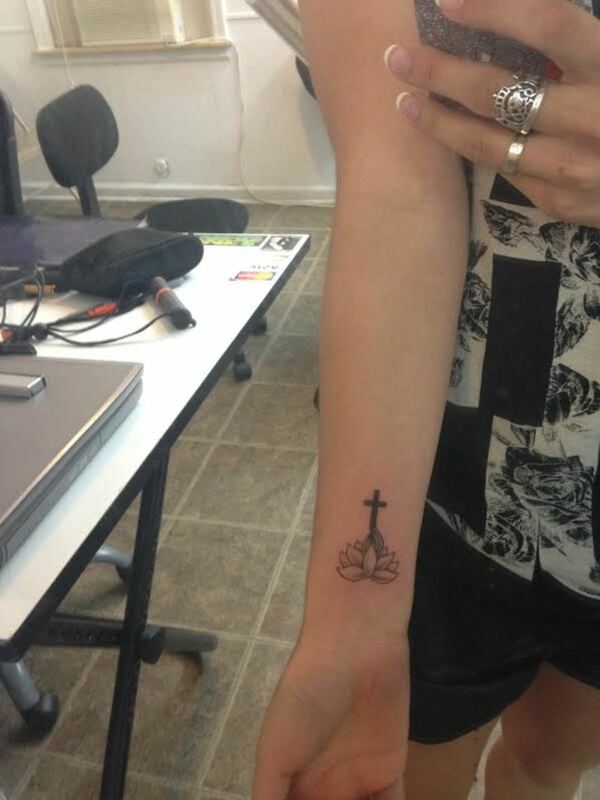 I used to live in fear of someone seeing my tattoo because I was so ashamed of it. I'd much rather people see my scar. Any chance at some one year update photos? Curious how much the color in the scar has changed. Jacob, you will have to get a doctor to look at your tattoos to get a definite answer. Mine required two procedures. This is what i mean by painstaking process of removing tattoos. There is no quick and easy way to removing tattoos. It just takes a lot of time. The reason i wrote this is because there is nothing on tattoo removal anywhere online that describes the process. I cannot beleive that isn't more in depth material on the subject. This made me so frustratedand i just went through the painful process and hope i have explained everything in the best way possible. I have to reiterate that tattoo excision is radical and it should be the last resort if you really just want you tattoos to be gone. good luck and take care. 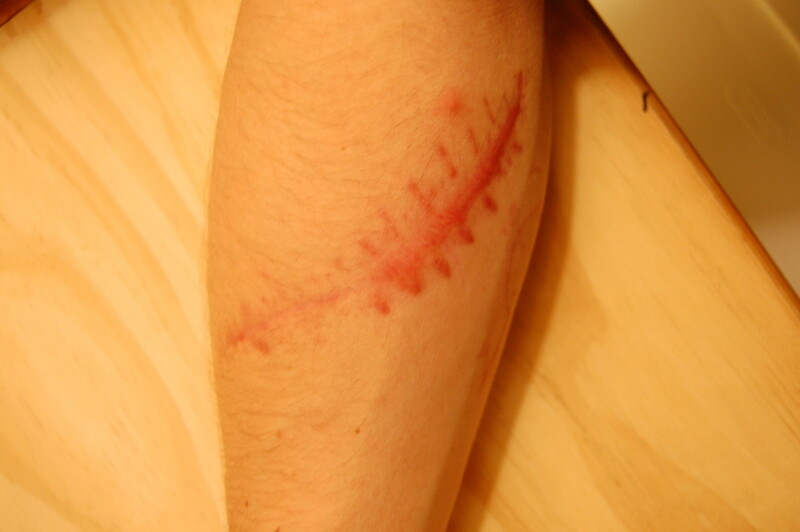 Randy, the last picture is what my scar looks like; except a little more faded. As i said excision should be the last resort because you will have a scar. 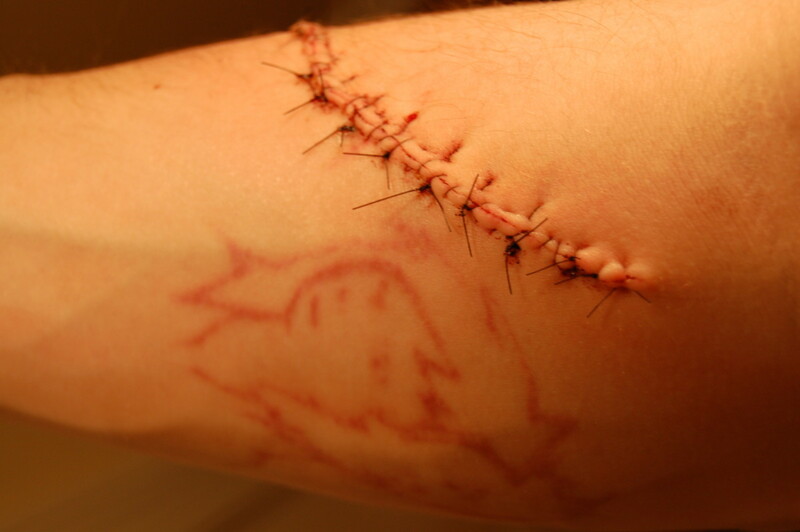 There are procedures after the excison heals for scar revision. Which i think is just excising the scarred area and redefining the scar line as neatly as possible. If you have the money and are unhappy with the scar this is the way to fix that. First off I would like to say thanks for taking the time to post this and reply to people. I have been going insane trying to figure out a way of removing 2 tattoos I got when I was in a very bad place on both my forearms. My question to you is about the size of both the tattoos you show above. The one on my left arm is 2.5x2.5 and other is 3.5x.3.5 I believe the smaller one will be able to be taken care of in one going but I am not so sure of the other. Do you have any input (from your doctor or in relation to size of yours) if this larger one will be able to only take one procedure? Again thanks for writing this and reading, I have not been sleeping and researching all over and this is the only worthwhile account I have been able to find. Hey do you have any updated photos? I had my excison done 3 months ago and I can still see where my stiches were. don't think a lot of movement with the scar is a good idea but its your call. you want to try not to disturb the healing process as much as possible to have the best results. I had a tattoo removed in about the same place as you but not it was longer and not as wide (5in long and .25 in wide) it has been two and a half weeks and all is well. I am supposed to do some wakeboard in a week and a half, so that will mean 1 month after the surgery, think the scar could reopen? have to go back and have them taken out. I just had a tattoo on my ankle removed by getting it cut out. I would be more than happy to send the photos they allowed me to take throughout the procedure. Looks pretty darn good for just over a month. I'm definitely going to check this doctor out. I really appreciate it Michael. Excellent info. The doctor made sure i had researched all other options and had seeked several opinions from different sources. Plastic surgeons offer unique services like this and most will determine whether the surgery is in your best interest. It was simple if you go to an independent practiceing surgeon. For the scar I am using mederma atleast 5 times a day. Would love to see update pictures. If it looks any good at all I may make the 6 hour trip for a consultation. Was it hard to get it done or was it a pretty simple "This is what I want to do" sort of thing? I know plenty of surgeons WILL NOT do this surgery. I wouldn't mind the scar at all as long as my motion wouldn't be limited. I'm going for my consultation today to talk about excision. Thank you so much for the post, I feel a lot better about going in. Thank you so much for posting this! 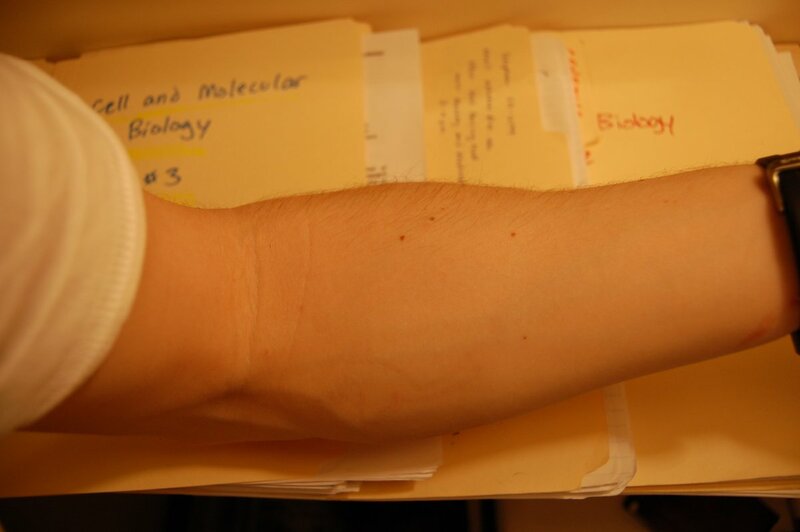 I am seriously considering having a tattoo on my forearm excised as I am going to school to become a teacher. This is literally the only site I have found that relates a personal experience with this procedure. My excision was done on March 23, 2010. I don't have an answer for long how long it will take to heal. My pictures don't show it but my excision goes almost all the way around the top of my arm. I could only find one other site that says the healing process doesn't take very long. I am going back to have the second half removed in about 8 months. If i could do it all over again i would have just done the excision. The laser treatments were no fun. 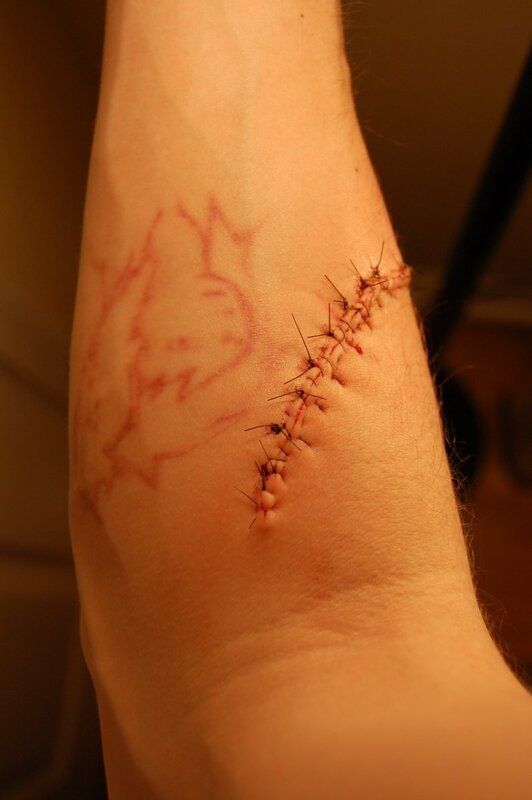 If you don't mind having a scar just go with the excision and save yourself a lot of trouble. I have a small tattoo behind my ear that says Faith and I need to have it removed within 6 weeks. I'm going into the military and they don't allow tattoos above the collar. I'm really considering excision because the results are immediate and I don't have to wait for it to heal for another procedure. However, how long was the healing process for your excision? I have about 6 weeks until I leave for training. Any suggestions? ?